Estonian Clusters is a web platform or virtual cluster initiated by Tallinn, the capital city of Estonia with the aim to support internationalization of Estonian companies, enhance networking and matchmaking and to make our clusters more visible on the global scale. 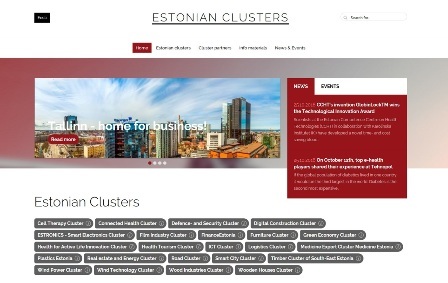 The cluster website www.estonianclusters.ee has been produced in collaboration with the main clusters operating in Estonia and comprehensively consolidates information like a window that can be opened to find the right way to the sector-based consortium of your interest. It provides a summarised survey about each cluster with the concrete contact person. - marketing & promotion of entrepreneurship and business environment (local business week, business awards, campaigns, study visits etc.). In terms of cluster development we manage the website www.estonianclusters.ee, organize monthly informal networking events (Clustering club) and facilitate the interaction between the local stakeholders and clusters.